This book is the first domestic specifically for the textile industry management innovation results of the case compilations. It was based on the "national textile industry management innovation achievement award" activities, then selection of 12 award-winning textile enterprises to compiled compilation. We hope it can to further summarize and promote the textile enterprise management innovation experience, promote enterprise innovation and development, and guide enterprises to deepen reform, then comprehensively improve the level of modern enterprise management, and promote the of Chinese-style enterprise management science system. This book has rich detail with clear and informative. It is showings the 12 textile enterprises in detail of the management background, development model, opportunity challenge and corresponding coping strategies. 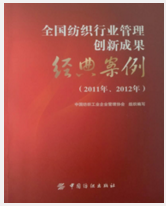 In addition, it contains the summary of innovation theory, introduction of industry background, management innovation, relevant Consulting solutions, and experts’ comments and so on. It has a unique perspective and timeliness for government departments, industry associations, enterprises, universities and research institutions. It have a greater reference and inspiration.